Hi my dear friends! Today’s PRACTICALLY SPEAKING is all about doing a little StoneGable housekeeping. Telling you a little “this and that”, making you aware of some new things you will find when you visit StoneGable and a little “heart-to-heart”. I have lots and lots going on with the blog and behind the scenes too… and I’m using today to bring you up to speed. Let’s get started! First and foremost I want you to know that YOU ARE THE BEST!!!!! And I love each and every one of you! Thank you for being the most outstanding community of best-friends-I-have-never-met and feeling like family to me! Just know that I strive every single day to bring you the best content, the prettiest pictures, and the best written (and you know what a horrid speller and proofreader I am) posts I can. I get up every morning and thank God for each of you! And I pinch myself because I just can’t believe that I get to do this (blogging) again today! It’s been my dream, for awhile, to have our community be able to not just comment on each post (although I love every comment) but to also share tips and encourage one another and tell our stories in the comment section of each post. I want you to feel free to express yourself too! So if I am posting about lampshades, for example, I would love you to chime in! Tell me about your great lampshade, where we can find fabulous lampshades on sale, or how you painted one. Ask a question or a give us a great tip about how to clean them, etc! Just keep it positive and kind. To encourage you to share and let you know how much I love you I am hosting a READER APPRECIATION GIVEAWAY each month. 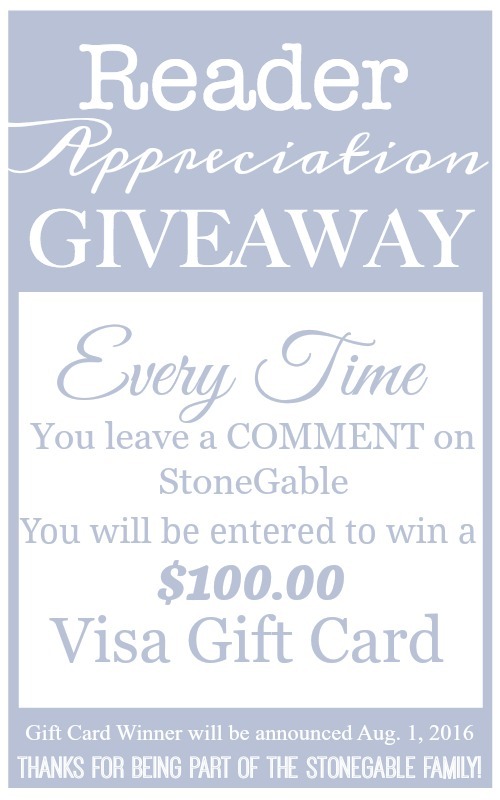 When you comment in any way on StoneGable blog you will be automatically entered in the giveaway. You can enter as much as you want. The more comments you leave, the more you will be entered. I REALLY WANT TO HEAR FROM YOU! This is to all those readers who think you don’t have anything to say…. YES YOU DO! I will announce the winner on Facebook the first of each month and then on StoneGable blog the next day along with the new month’s giveaway! I have some pretty sweet giveaways lined up for you! It’s my way of saying THANK YOU!!!! You don’t have to ever miss a new StoneGable post! Every day the FEATURED POST is front and center on the newsletter along with what we call it’s BEAUTY SHOT. You can read a little bit of the post and then click READ MORE and the link will take you right to StoneGable blog! Easy peasy! Make sure you click over to the blog to read the whole post and to leave a comment. And don’t forget to pin! I LOVE LOVE LOVE my pinners! Thanks! Also on the page you will find access to my social media platforms. Join them and join in the fun! The three to join are Instagram, Pinterest and Facebook! Under the Social Media icons you will find 3 of my over 3,500 archived posts that I think you might enjoy. I choose reader’s past favorites, seasonal posts, and post I think will inspire you! This is your chance to see new-to-you StoneGable posts and to revisit your old favorites! Lastly, you will find GET THE LOOK, READER APPRECIATION GIVEAWAY REMINDER, AROUND STONEGABLE and other fun “StoneGable stuff”. GET THE LOOK is a new addition to the Newsletter. You will find my favorite StoneGable style products that I have in my home and also those I am crushing on right now. When you click on the word “HERE” the link will take you to the site that is selling the product and you can find more info about it. 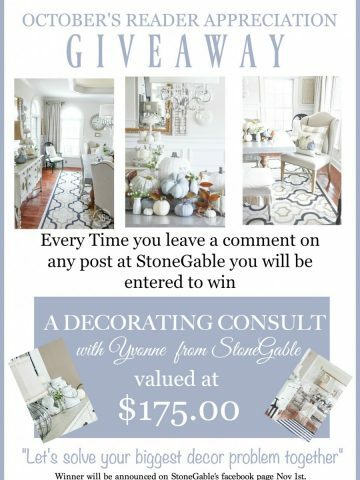 Remember every time to leave a comment, tip, share a story relevant to the post or encourage another reader your name will be entered to win a fabulous monthly giveaway! I’ll make sure to put a reminder for you in the newsletter! And I’ll also post images around StoneGable and give you an inside peek at our life here… sorta behind the scenes! The newsletter is free and will come right to your inbox! If you have not joined the thousands and thousands of readers who get the StoneGable newsletter every day, now is your chance to sign up! Fill in the boxes below and click on “SUBSCRIBE”. Then look for a confirmation email in your inbox and follow the directions. That’s it! I hope that my newsletter will show up in EVERY reader’s email box! Did you know that the number one question I get asked is, “WHERE DID YOU GET THAT”? So many of my readers have asked me to includes links to the products that I use in my home and have on the blog. So… you asked and I listened! 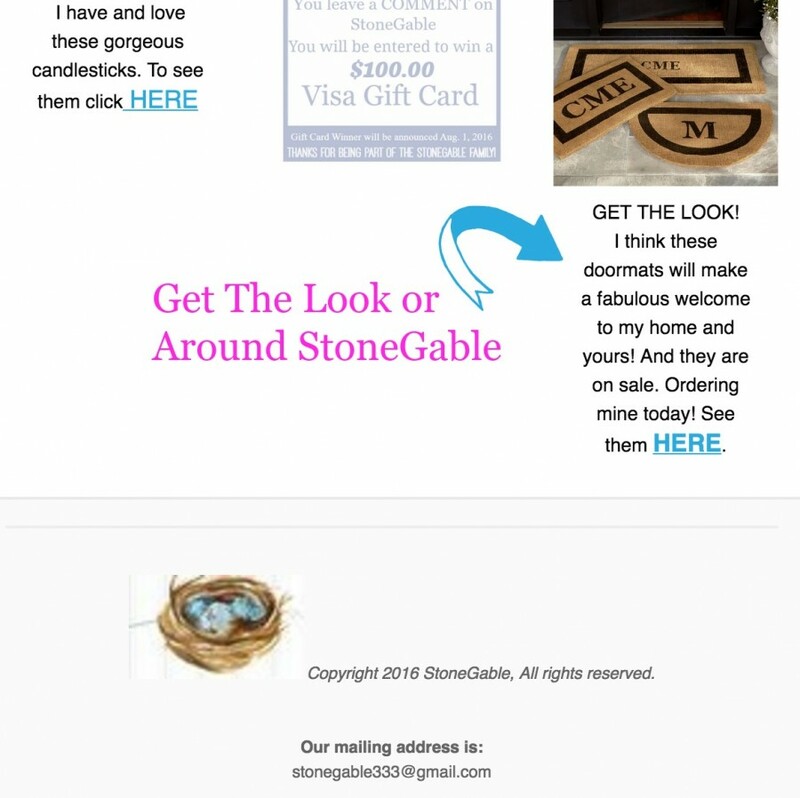 I am so thrilled to be able to link StoneGable style products now. This gives you, my amazing readers, the opportunity to view my favorite things and even purchase them if you choose. So many of you have emailed me to thank me for this addition… you are so welcome! And lastly, I have some new and exciting things coming to StoneGable this fall and into the Thanksgiving and Christmas seasons! Fun ways to interact as a community and more ways to win some very exciting things! 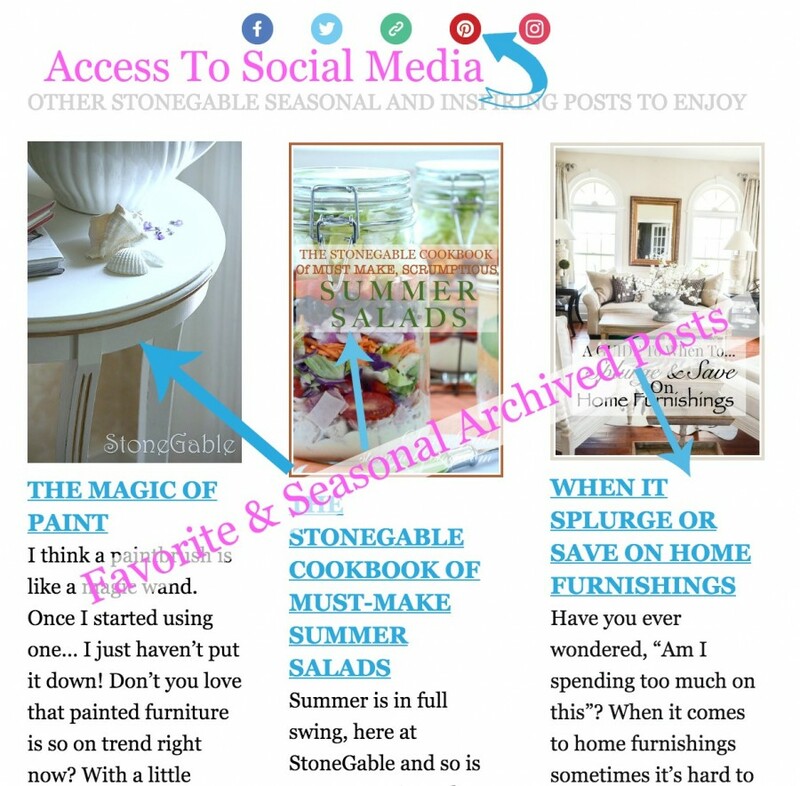 As always, I work on making StoneGable your go-to source for all things HOME!!! A BEAUTIFUL BOOK BY A BEAUTIFUL FRIEND! I have missed the daily email blog. Did something happen? I’m sending them every day! Check your junk mail or spam folder, Judy. Depending on the settings of your computer some emails and newsletter can land there. Just find one and put it back in your inbox then you will start getting them again. They will always appear in your inbox. Love your home and love the fact that you use color in your home and not all white and gray…….thanks for the tips…..and thank you for the prospective from a Baby Boomer’s Point of View……..
Good morning Yvonne! Thank you for sharing your cleaning process. It’s an approach I haven’t thought of. Do you ever need to get help to clean? Hello Yvonne, I’ve been following you for a couple of years now, and have been blessed by all that you do. You have inspired me to be more crafty and really look at my home as my sanctuary. Thank you for the great DIY’s. Looking forward to more Fall and winter holiday decorating! I’m back again ~ because next I saw the post on “Painting Books!” I AM way behind! I LOVE this (even more than those covered with burlap)! I have been buying lots of old books lately to use the “browned” pages for various crafts. Some have turned out to not be just right, but I can’t get rid of them: I have some classics! So now I can take all these multi-colored books and use “your magic” on them! My bookshelves and vignettes will look so much better now! Wow! I missed this when it first came out because I could not be online as much then (for a couple reasons)! I am very excited to read about your changes to make StoneGable even better ~ as if that’s possible! I consider your blog one of my favorites, and look forward to all your posts. Now they will have even more for us, and I can’t wait! You are to be admired for all you do ~ your energy level amazes me! And a big thank you for now offering the monthly gift drawings … how much fun this is going to be for us! Thank you for going the extra mile for your readers and viewers! I love your style! Yvonne, I use to keep stacks of magazines! I cancelled them all! You are the best! Thank you for inspiring me! Your newsletter is one of the highlights I look forward to in my email! I am so glad I came across your site. Each posting has so much useful information and your sharing from the heart really blesses me. Thank you Yvonne for your willingness to pour yourself into everything you do! Yvonne, thank you for a fabulous blog. 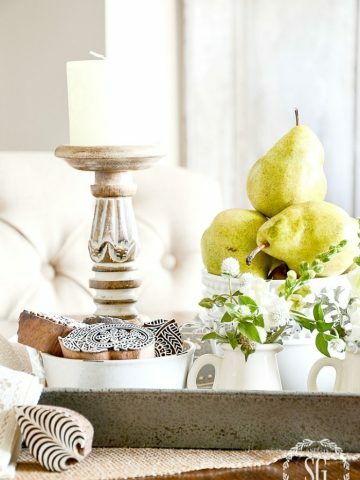 Yours is the first I go to for great decorating ideas. I even bought the yellow pillow with pom poms from Walmart that you featured. And thank you for praying for all of us. It means a lot to me and I pray for you too. Barb! That is so nice to hear! Hello Yvonne, I very rarely comment but I have on your site! I just want to thank you! I so enjoy what you do and how you do it. I have always enjoyed being domestic from decorating to cooking and love for dishes, sewing, upholstery and crafts. I have signed up for many blogs and receive numerous ones daily but yours is the one I always open and take time to read! Just a suggestion…please put this “Comments” area ABOVE the other readers’ comments. When there are so many comments, there’s a LOT of scrolling! Always wondered, too, what the font is in your Header…it’s very striking! Thank you for all your hard work! Always love opening your email first thing every morning…….so refreshing and a great way to start my day! When I opened this email, my first thought was “Oh, NO….this might not be good”….thinking that you might be discontinuing your blog or changing it drastically or something…..but thank goodness, it wasn’t that at all! Love all of your creative ideas as well as reading your Sunday blog which is so uplifting! I, too, am a Christian and would not be the positive, upbeat person that I am if not for my faith. So “Thank YOU” for your Spiritual devotion, not only on Sunday but each and every day. Thank you for your lovely blogs that i look forward to every day! Thank you for your inspirational and creative blog. I discovered you a few months ago while trying to recuperate during a major lupus flare. I was unable to drive or even walk very far. I thoroughly enjoy reading about your home while trying to relax in bed at night. I am feeling a bit better now and have decided to redo my dining room in a black and white theme based on what I have learned from you and the others who participate in THE SCOOP. Hi Nancy, I am so happy you are feeling better! I pray that you stay healthy!!!! Welcome to the StoneGable family! Yours is the first email I open each day! Love the blog roll on the side – when I have extra time I love popping over to others and being inspired – and then I go to work and wish I was home so I could move things around! 🙂 Was looking in the archives and love the idea of storing napkins vertically – makes such a difference and seems like a no-brainer! – why didn’t I think of that sooner? Love to you and God Bless! I am going to love these changes. I always visit your blog for a little blogger inspiration. When I feel like my images are getting stale, I come look at yours. When I struggle with an organizational aspect of blogging, I come look at your blog. I love the content and love the example of blogging done right. You already know I love your blog my sweet sister through Christ. I look forward to your posts in my in bin each day. I know how much work this is and I am grateful. Hugs! Your posts are my favorite to follow ! Most of all, I love your heart… And the combination of spiritual Truth along with sharing your love for beauty. A woman after my heart.. Thank you! Love your home. Thanks for sharing it with the world. So enjoy your blog and your beautiful home. Signed up for the newsletter! That’s one email I’ll actually be looking forward to! Thanks for everything you do! I love the blue and white striped pitcher with the summertime lovin’ blossoms! Yvonne, I love your blog and I share it often with others. Love your ideas and photos. Thank you for sharing it all with us! I have been subscribed to this page for over a year now and I finally decided to take the plunge . After all this time I’m stepping out of my comfort zone and repainting my guest bathroom to showcase my seashell collection. Thanks for the inspiration. YOU GO GIRL!!! Enjoy your newly painted room! Yvonne, I love following your blog. I have learned so much from you and your photos are amazing. I don’t know how you do it everyday. I pin all of them and you know how popular your pins are (still my number one). I always come here for decorating ideas. They are easy and so well explained. Enjoy reading your blog. You make homemaking very appealing to a retired person. Yvonne, you are such a blessing to all of us! I check into your blog every day and I have for years. I also follow you on Instagram!! Though we probably will never meet this side of Heaven, I consider you a friend! Pleased to receive your newsletter. Your photography is magazine worthy. I look forward to your posts. So many practical tips! Love your blog and all the decorating ideas, recipes and Bible Study! I so look forward to your blog and follow you here as well as instagram & facebook. I just can’t get enough of your fabulous self!! Keep up the good work!! I read you right after I read my Bible, pray and give thanks for each day!! You are my present I give myself daily!! Love you, girl!!! I love your blog! It’s my favorite! Hi, there! Yours is one of my favorite blogs. I love seeing Stonegable in my emails. Stonegable never gets old. It’s always up-to-date and inspiring! Keep us going with your great ideas! I always love seeing pictures of your home. I would like to get better in my hospitality skills. I love having others in our home but feel busy with five kids and their activities. Hi Yvonne! Love you and everything about Stonegable! I’m happy to hear of the new additions AND excited to see what you have in store for us! Thanks for all you do and bring to Stonegable to truly brighten my/our days!!! YOU are a gem! Thanks for being so inspiring. And making me feel like I can actually do many of the things you show. Love the new info you are sharing today. I especially love the inspirationalbum messages your share on Sunday. Thanks. I love your blog and look forward to it everyday. I can’t wait to see what you have planned for fall and the holidays. Your blog is the one blog I MUST read each day. Not only are you a fabulous decorator but you live in my home state of Pennsylvania! I love when you mention something unique to the area! You are by far my favorite home style blogger. I always learn something new or fresh for my home. Your recipes truly are the best and many have become family favorites. I talk about you like a friend and quote you often. Love the new changes especially where to buy items!! I like seeing your pretty home, my favorite room is your kitchen. Been reading your newsletter for a few years now and it’s still my favorite! Pin almost all of your posts and started sharing them with friends. Now several of my friends read your newsletter daily. Sometimes at work you and your posts are the main topic of the day. We ooh and aah over a lot of different things. You always do such a fantastic job and looking forward to more great inspiration. Hi Alison, a big HUG to you and your friends at work! Thanks so much! Your blog is one of my daily reads. I love your Sunday posts as much as the daily ones. Beautifully done pictures and ideas and I enjoy them so much. Thank you. I have so enjoyed following your blog everyday. Your home is so beautiful and your sweet and loving spirit is obvious in each post. Best wishes as you continue to inspire. I tell my husband first thing every morning “well I have to see what Yvonne is doing!” I enjoy your posts so much! Thanks for the lesson on drying herbs. I am new at herb growing and preserving them, so appreciate any advice I can get. Hi Terri, Herbs are wonderful!!!! I use them just as much in floral arrangements as I do in cooking! I enjoy learning from you! 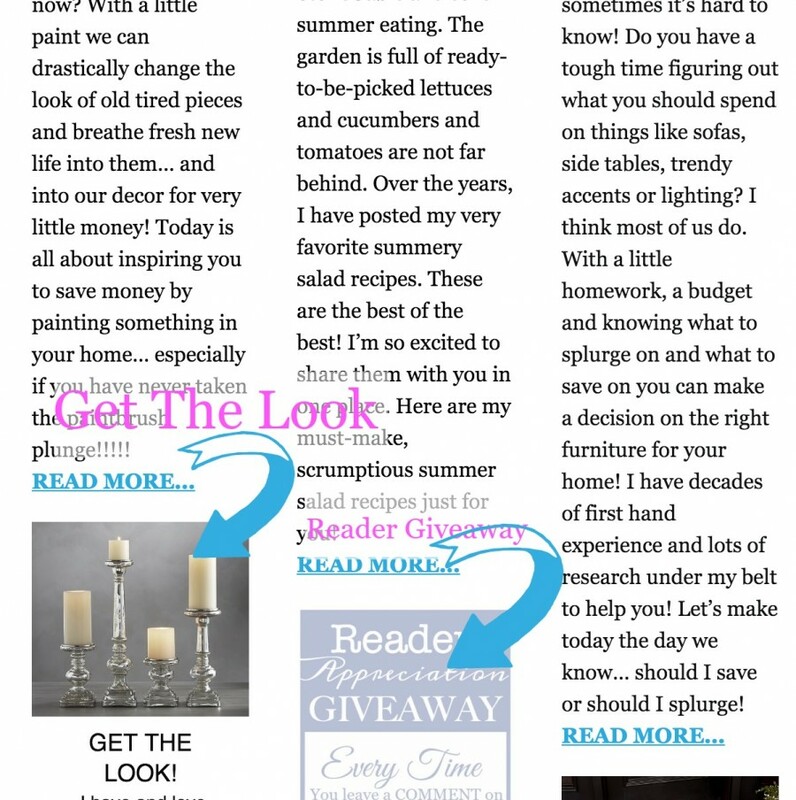 Beyond Yvonne’s fabulous style, beautiful decorating tips, great recipes and more, she cares about her readers so much. She has taken the time to answer my email and help me with questions I had about color and paint. She is awesome!!! Exciting growth for your blog! Congratulations! I head here anytime that I need some extra home decorating inspiration or a “Good” word. As a fellow Lancaster Countian I wanted to tell you what I found today at the Basket Warehouse on Rte. 72 near Manheim… Aged (new) olive buckets for $14.99! I’m sure you probably already know about this store but they have many decorative things that would fit in a farmhouse themed home. I wish I could add a photo to my comments because I took several of them with you in mind. Anyway, love your home and love reading your blog! Thank you! I enjoy your blog so very much and look forward each Sunday to your “Sunday School Lessons”. You should teach if you don’t, because you are so great at explaining scriptures. Could you please include some pictures of your wonderful garden again this year? Last year it was so beautiful and lush. And, your tomatoes are so big and beautiful! Love tomatoes more than anything! Blessings to you. You are truly a treasured friend! I’ve gotten so many ideas from you and have incorporated them into my home. this because everything in it was perfect in every newsletter picture! You keep your HOUSE spotless which really threw me!!!!! HA But love what your do and looking forward to the surprises coming this Fall. Also the giveaways will be fun too! I appreciate the time and effort it takes to create an outstanding home and then photograph and blog about it. I especially appreciate that you share where you get your wonderful finds and respond to questions and comments from your readers. Your idea of creating a community for sharing will only enhance an already wonderful site. Thank you so much for adding the “get the look” to your postings. I get so frustrated when I see a paint color or a lamp I love on a website, and there is no info. Along with Joanna Gaines, you are my mentor. I will probably never meet either one of you this side of heaven, but your style, your energy, your love of family, and your commitment to Jesus Christ, are things that I also strive for each day in my pursuit of being who God wants ME to be. Hi Yvonne 🙂 I’ve done lots of projects but have never even thought about posting them! Maybe I’ll start taking before and after pics now so I can! Thanks! I love reading your newsletters every morning. I always have a note pad nearby to jot down references or notes. Thank you for the Products in the Posts addition and the information of the items shown. So thoughtful of you to do that for your readers. All your posts are so inspirational and so many ideas flow from them, decorating, recipes, Diy tutorials, art, vignettes, home tours, so much more and Sunday devotions are so special. Your The Best, Yvonne, truely a blogland Star! Hi Kay! I love the idea of keeping a notepad to take notes. I will be doing that when I read magazines! I want to thank you for adding the get the look and products in this post. I was in Walmart today and they have some cute lamps that look like wood. I have a thing for lamps but I did not get one but maybe some other time. I love your blog and how you decorate! I wrote to you a few months back while I was in Pennsylvamia taking care of my daughter and new baby. Thank you so much for your list of places that you love to visit when looking for things for your home! I have the list and look forward visiting some of those places when I come back in a few weeks. The greatest find I found in Exitor was a small antique shop that had some antique shutters!!! I was so excited!! You just can’t find those things here in the west! We aren’t old enough! Your blog is my favorite and your decorating ideas are exactly what I love! Thank you for sharing your talent with all of us and for being so kind as to answer inquiries that come out of the blue. Have a blessed day and please know your talent is appreciated my me! I’ve not found Exitor yet. Congratulations to your daughter and new baby… and you too! Can’t wait to see what you have in store for fall. Your blog is beautiful. I have visited many, many times and have gotten many tips and ideas. Your home is just gorgeous! You have such a gift! Sharing such good information and good links is one thing, but your warm and friendly style makes me feel like I’m your girlfriend and I have lots of friends through the comments! Thanks for everything! Keep up the good work! You keep on believing that I sound like a grand southern lady. I’ve ALWAYS wanted a southern accent! Oh, neat-o and Yay! Well you know how much I love your blog – have for years – this is awesome, thank you so much, Y! Your blog is truly the best! Your advice is always excellent and your home is so lovely! I think the best part of Stone Gable is that you are so honest, warm, and just seem like like you would be a great friend! I love your posts and read you every time you post. I am not saying this to win, I truly appreciate your blog! Keep up the good work! What a wonderful idea! I am looking forward to your emails. I love your style! I cannot imagine how active your day must be, each and every day! Does your husband ever wish you could turn off some of your creativity? Mine does! He is so funny wishing bloggers and Pinterest would just go away so he could have some peace! Thank you for keeping us all inspired! I have had a pair of ginger jar lamps for a very long time. They were the first things I bought when I started teaching many years ago. They have been through many different lampshades over the years. I just can’t bear to part with those lamps. Too many memories. LOL Thanks for all the decorating tips. Thank you for sharing your wonderful ideas! I enjoy reading your posts and have used some of your ideas…. ? Found your blog within the last month; I ‘ve read your archives and have since made this a daily stop. Love reading your blog and use your photos for inspiration. Wow! I didn’t think Stone Ganble could get any better but it is. I especially like the addition of the links that will allow us to see, and possibly purchase, so many of your beautiful furnishings. Thanks for continuing to inspire us. I enjoy reading your posts every day. They have wonderful ideas and great directions. I also enjoy your inspirational messages. I didn’t have to scroll for ever..lol. On iPad new comments are added at the end…sometimes way down. I am not sure if this is just an iPad thing or not. Is there a way, if possible, to add comments at the top? Btw..I am a horrible speller and proof read too..
And, because of auto correct…sigh..my posts are even worse than I really am! Your beautiful pictures is what first drew me in. About nine months ago. At that time I signed up to receive your newsletter because I didn’t want to miss anything. And, I still am with you and enjoy them. Sounds like more great things to come. Your blog is just “the best”! I’ve been a fan for some time but never left a message. Live just over the Berks County line and do most of my shopping in Lancaster County. Imagine my surprise to learn you live in Lancaster County! Keep up the great inspiring blog. Whew! When I read the title of your newsletter, I was bracing myself for bad news that you were shutting down your blog. So happy that Stonegable is going to be better than ever! I too love your blog. It’s always packed with great information, beautiful pictures which are very inspirational. Thank you for all you do. I’m a newbie,and I’m loving your blog. So glad I joined up. When I get the time,I’m going to catch your older posts. I feel so welcome. Thanks for the hospitality . WELCOME to the StoneGable family, Sue! So glad you are here! Speaking of lampshades…lol…I was having a hard time finding affordable black replacement shades for my bedside lamps, so I decided to unify them with black chalk paint. They turned out great – until I noticed the empire shade had caved in at the top…the cylinder shade was fine. It took a bit, but I eventually found matching lamps that fit in the budget. The vintage lamp with the cylinder shade in now on my sun porch…the other lamp is in storage until I find a black lampshade for a nice price (I’d also used the chalk paint on the base of the lamp, which turned out very nice). I found you on Facebook. Right now you’re my fairy godmother. I want you to know I very much appreciate your elegant and inspiring style, beautiful photos and gentle loving approach to life. Your blog (and that goes with it, Facebook/Pinterest) is a work of art, the hard work you put in (and I know it is) really has created an exemplary site. Thank you. Hi sweet Rose! I’m so happy you found our community! Welcome to the StoneGable family! I love your energy Yvonne! This was a great read. I am looking forward to your Thanksgiving & Christmas “reveals”. Your easy tips for changing a room for a new season is one of my favorite things about your blog. Looking forward to hearing more from you! You are always so full of information and fun! I too love sharing and finding links. What a great resource we have as a community! Oh my goodness, this southern gal looks forward every day to your posts! I really have a learned a lot from you and so appreciate your sharing your great creativity. Wish I had your energy! Thanks for all your posts and inspiring me to be more creative! God has blessed you with such amazing talent and decorating insight. Sharing this with us has is a blessing to us. Thank you for the time, effort, and love you put into each blog post. I get much pleasure from them. I so love reading your newsletters, I reference back to post quite often. Love your ideas.loooking at getting and painting some little pumpkinss white for fall. I some little paper lanterns lights at target the other day.. I which I lived closer I would love to be your assistant. Love your blog and all the helpful hints and tidbits! I have enjoyed seeing your pictures from “around Stonegable”. You live in such a pretty place! I can’t start my day without ready your blog! Thanks! Awe, Kimberly! Thank you for working me into your morning routine!!! Wow, Yvonne…you scared me! It almost sounded like you might be winding down with your Stonegate blog and then the great news that you are gearing UP and moving FORWARD!! Evidence that Such good things await us if we but have eyes to see and willing hearts to obey. Thank you and many, many blessings! I thought that too that you were going to stop blogging. Like so many others that have left a reply, I enjoy your blog every morning while drinking my first cup of coffee. You are always inspiring and I wouldn’t miss a day of your posts. I love reading your blog and getting ideas from you, I have tried several of your recipes which have been great! I love your devotion to God and I can tell he has blessed you. It seems your comment feedback has worked and I am so very happy for your success!Keep it up, I too enjoy my Stone Gable newsletter with great anticipation of what you have in store for me next! Thanks for making us all feel like we are such special friends of yours!!! I am a new subscriber but already feel like an old friend. Such an endearing site. Hi Janet, Thanks for subscribing! I hope you get even more inspired! Your blog is one of my favorites. I love your style! I start every morning with my cup of coffee and your blog. Maybe you can tell from all of the responses you are receiving to this post that you do impact ours lives in various ways – from hints to inspiration to spiritual. I follow you on Pinterst, too, and several of your beautiful kitchen features are being incorporated into the design of the kitchen in our new home. I love it that you will be regularly adding a regular sources link. We are located in a rural area and my shopping options are very limited so this new feature will be extremely appreciated by me. Thank you Yvonne. You are a true blessing in my life. I get so much inspiration from your blogs. I’m really excited about the holiday season and all that you have in store! Thank you so very much. If and that is a big IF I get my master bedroom done I am so excited to decorate it! I get so much inspiration from your blog. i’m really excited about the holiday season and what you have in store!! Love all that you got going on! Helping each other find good deals and ideas is wonderful! Love, love, love your blog, Yvonne! I live in Miami, and farmhouses are non existent here, so I live vicariously through yours! I soooooo wish I could have a farmhouse! Clearly I am in the wrong city, haha! Already subscribe to your newsletter and Pinterest; will add FB on also. 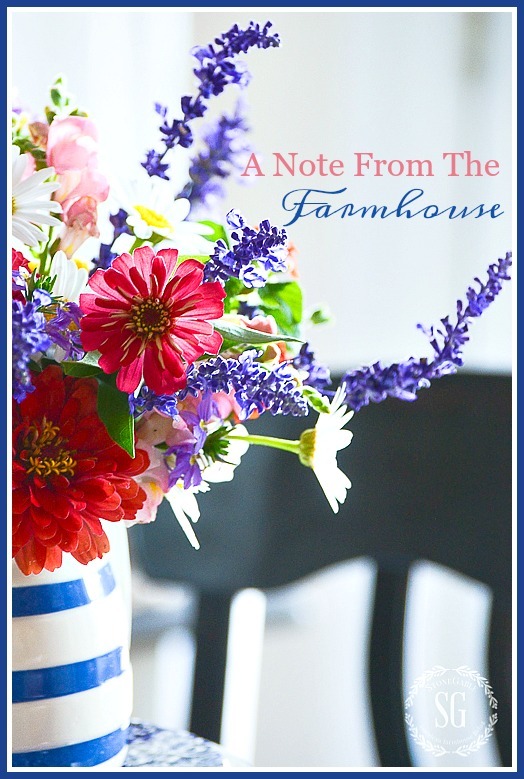 I have been inspired by you to add a few “farmhouse” touches to my home to try to make it as farm-homey as possible. Thanks for sharing your home with us! We just built a cottage in the sleepy beach coast town of Gearhart, OR and its interiors are inspired by many of your posts! I found your site just in time. And I was blown away when you answered my question as to where to purchase a darling pillow you were showcasing. Just blown away! So thanks again. (Out cottage can even be be rented . . . Go to Evolve.com). Thanks! When we eventually sell StoneGable in about 50 years I have a dream to own a cottage on a lake. Sounds so romantic! I’ve never been to Oregon… it’s on my bucket list! You are by far my number one favorite blogger. You just keep making the reading experience even better! Love your style! Thank you. I recently discovered you via Pinterest and have reading through your blog. You have a beautiful style and I look forward to seeing more. Welcome to the StoneGable family, Kim!!!! I snuggle up with my computer (is that even possible?) and a hot cup of coffee every morning and one of the very first things I read is your newletter/blog for the day. I love starting my day with you! You have created a wonderful home and community here online. Thank you for welcoming all of us! And your blog has been very dear to me lately. I am going through my whole house on a big purge – selling furniture, changing paint colors, and doing alot of “behind the scenes” decluttering. I have even chalk painted a few pieces of furniture! Totally hooked on that! Reading your blog helps remind me on the days I feel like throwing in the towel why I am doing what I’m doing. First, I want my home to be just that to my family – a home. And second, it is so much fun! At your blog I find inspiration for both. A big thank you! It sounds as if many of us are having coffee “together” each morning as we read about StoneGable ❣. What a treat that is…inspiring to start each day with you ! Love , love your blog!!! I have enjoyed so many of your tips and home decor ideas. Your Sunday blogs have been a special treat. Thanks for sharing your heart. Feels like an old friendship rekindled. Have a great day. Yvonne, I simply enjoy your blog. It’s the first email I open in the morning. You are overflowing with ideas, decorating, recipes and just plain old good advice. You share your love with all readers! I am a long-time subscriber to your blog and love it! These new features will make an already great blog even better!! Love your style and always look forward to the Sunday devotions. Thanks Yvonne for sharing with us! Yvonne, I receive your blog each morning in my inbox. Is that the same as “the Newsletter”? Thank you for the level of excellence you put into your home and your work. Hi Sherry, you are getting the newsletter. Make sure to click over to the blog and see the whole post and other things I am sharing too! Good morning! I appreciate the hard work it must require to have such a beautiful blog! I have been following you on Pinterest for some time now. And have been receiving your newsletter for a while as well. I am always inspired & encouraged after reading the newsletter. Thank you for all you do for us! Have a beautiful & blessed weekend!!! I love the “get the look” concept! So many times I’ve seen things that are just lovely and I wonder where you got it … I just figure that it’s a special find. I love your style! I love the changes you’ve made. Can’t wait for the giveaway! I credit you for improving my decorating sense dramatically. There was always something missing and I couldn’t put my finger on it until I started subscribing to your blog and realized what was missing was, “fluff!” Now my mantles, vignettes and really all aspects of my decorating look cozy and complete. Thank you!!! Your attention to detail really makes a difference! I found your home on pinterest and fell in love with your blue guest room. I absolutely love it! I already signed up for your daily blog post and enjoy reading it because I know I won’t miss anything now. Love it all thanks for sharing! I just signed up for your newsletter. I have been following you on Pinterest for a couple of years now. I really connect with your decorating style. I have used many of your ideas or their cousins in my own home. Keep the great content coming. Thank you for letting me take a peek into your beautiful home and feel inspired. I like and appreciate your faith filled posts. I really felt special last night with your Facebook post of prayer( I think I was the 14th or 15th like haha) I don’t want to read the “perfect person and life” blog, I appreciate the misspelling! I need the encouragement that I “am not the only won (haha).” Have a sweet day..
You always have such wonderful advise. Thank you for always taking the time to show your readers how things are done, and your step by step instructions – Your pictures are beautiful as is your home. Love reading your post!! So much creativity and inspiration!! GREAT ideas with your newsletter! Can’t wait! I love your blog! I have a million things todo around the house in July and August but I’m curious about what other people focus on? Like spring is for cleaning and May preparing your outdoor area. I do have kids preparing for school, maybe getting kids rooms ready for school? If you don’t have kids what are we doing in our homes? Oh Anne, what a lovely note! It seems there is a MORNING COFFEE CLATCH of StoneGable reader. I’ll drink my morning coffee thinking of all of you from now on! Your blog is my favorite! I have gotten so many ideas & tips from you. I am in love with your home- especially your kitchen! I am a big fan of black & white! ? Opening your email post each morning is my Happy Time and your blog is my Happy Place. 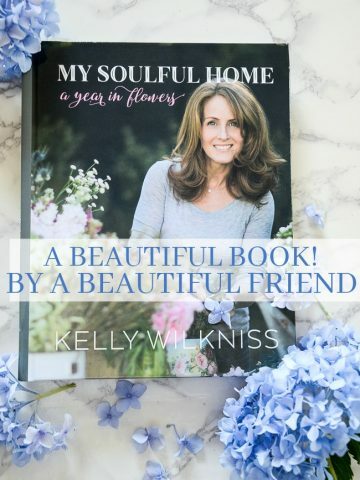 Thank you for brightening so many lives with your beautiful home ideas as well as your spiritual insights! Enjoy your creative ideas that can be incorporated into my small home. Yvonne, ever since I found your post a year ago or so, I look forward every day to opening my email to see what exciting, beautiful, new things you are going to share. Sunday is a favorite day with your incite about your favorite verse or story… makes me stop and thank the Lord for my blessings. I also love when you share a new idea or project and think “what a cute ‘easy’ idea”! The best is when I make something you’ve demonstrated step by step and it turns out beautiful! Gives me a sense of accomplishment. Keep up the good work Yvonne, and may God continue to bless you! Thank you for all your hard work! Bless your sweet heart, Sherry! Someone commented recently that our home reminded her of Stonegable. What a compliment! You are amazing and such an inspiration! Thank You! Oh WOW! That’s a compliment for me too! You get best comment of the day!!!!! Thanks for info and links to where you purchased things. Love your blog. Yvonne, I love your blog and have followed you for many years. Your blog is one of my 5 favorites. I look forward to your Sunday Scripture too. Thanks for all the hard work you put into your blog. Being in the top 5 is a GOOD thing! I have loved your blog for years now and it just keeps getting better. Sometimes I feel overwhelmed from the amount of ideas and information . I don’t know how you do it. Do you ever sleep? You are amazing and so talented. I have a question. What color of paint is the exterior of your home? I, especially, love the color of your front door. Good morning Yvonne! Thank you for your blog,I look forward everyday to see what is new at Stonegable and what inspiration you have to share with us blog followers. Your the best have a good weekend! Yvonne, your blog was the first one I started following. Look forward each morning the the title and what is in store to read and see and Enjoy!! Love the new ideas you have come up with, especially Get It Here! Such a wonderful community of followers. I enjoy your ideas and the followers comments and ideas. Follow you on Pinterest and Facebook but not too good at Instagram. Need some help with that one. Definity get an Instagram account, Patricia. You won’t believe the beauty there! I love reading your beautiful blog each morning. I have been doing some updating to my home and your blog has been a great source of inspiration to me. I love your tables apes and recipes. And I am sure that ai will find the new links helpful too. Thanks for opening your beautiful,home. I love it all !!!!! I never miss a post & often use your tips & decorating advice in my own home. Visiting your shopping sites gives us all an opportunity to purchase so many wonderful products. Thanks for sharing so much with us on your blog! I just love your blog. Thank you for all the time/effort you take to make it a special place for us to visit and learn! I look forward to your newsletter every morning! Such great ideas beautiful pictures and ways to do things. I am actually going to make your burlap and sheers curtains, I’ve already purchased the typewriter keys burlap! Just need to finish up a couple of other projects…can’t wait! Thank you! Thanks for the opportunity to win fabulous gifts! Good morning Yvonne. I look forward to reading your blog and always learn something. Thank you for showing me how to make a house a home! Yes, I subscribe to your newsletter and love it!! I usually scan it and look for a DIY idea, knowing that I can find it on your site at any time. Your burlap trimmed sheers in your family room are my next project… on my long list ? Your posts are wonderful and I enjoy them every day. I love the Sunday Posts and enjoy them before we go to church and usually read them again Sunday Afternoon. They are wonderful, and inspiring. Thank you for all the great ideas. You’re obviously talented but you also seem so sweet. Thanks for your daily posts. They’re amazing and I know they’re a lot of work. I have followed your blog for years and you never disappoint! I believe all of your readers can see the effort you put into every post. Thank you for bringing such inspiration. Thank you for such informative, creative, and fun posts on your life and home at StoneGable! Wish we lived closer so I could invite you over for coffee or tea. Love your home Yvonne! I enjoy reading your blog and discovering new ideas. Inspiration plus! Love, Love, Love all things Stonegable!!! Thnak you for sharing! You are so inspiring Yvonne! It makes me happy to see what are doing everyday! You are perhaps the most kindhearted woman I know. I know that because we’ve met in person at blog conferences. You are truly a blessing. I do look forward to your newsletter with beautiful style and words of encouragement! Hugs! Oh my goodness, Christy! Right back at you!!!!! I feel the exact same way about you too! Kindred spirits. I love that you will share “get the look.” I discovered Hayneedle from your post about the outdoor table and chairs that you recently purchased. I found a beautifully made all wood breakfast nook table that I absolutely love. It was so reasonably priced that I was a little dubious about the quality. When it arrived, within just a few days, I was very impressed. Now all your devoted followers will be able to find real gems for their homes. Thanks for everything that you do. 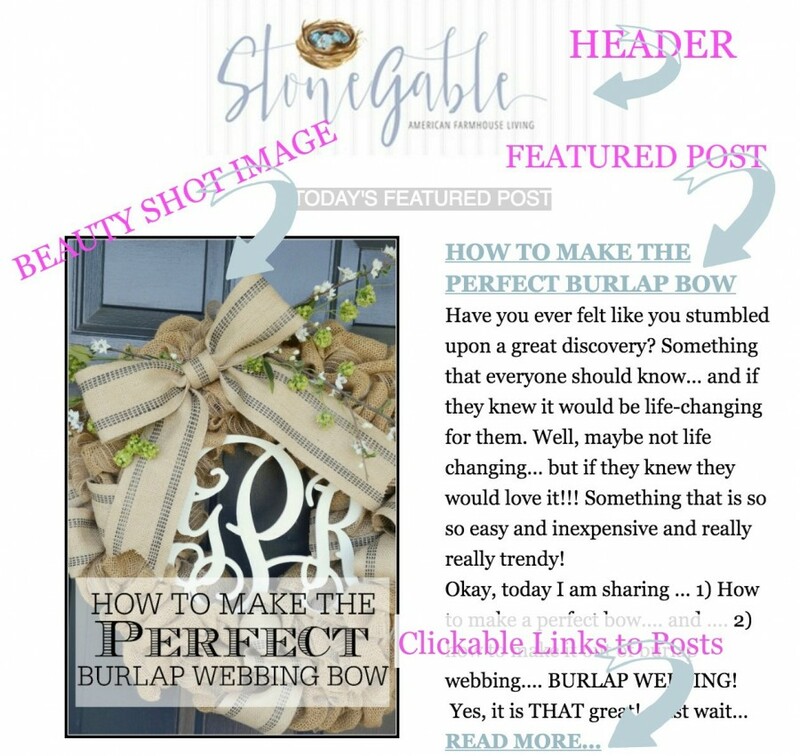 Enjoying the “Stone Gable” blog – very informative and inspiring! I really enjoy your blog! I look forward to opening my email to see what you are sharing! Thank you for all the information. Your place is beautiful! What a fun idea! I love seeing what you have done; seeing what other people have done will be great too ? ‘Morning Yvonne. Luv the ‘get the look’ bit!!! Thank you for the news – I love your blog and your home. I enjoy reading your posts daily. They inspire me. But most of all I am Christian and love reading your interpretations. We are so blessed in this country. I don’t think we thank Him near enough. Just subscribed! Love your style and especially your positive outlook! God bless! Thanks, Beverly! I hope you love it! Exciting news…just love looking at your beautiful pictures! Love your blog, it is the first one I look for in the morning , and you never disappoint!! Sounds like you have a lot in store, and so glad you will be including how to purchase things YAY!! . I send you blessings on your new venture, I will be looking forward to it…. So sweet Kathy! Thanks so much! I always enjoy the beauty of your photos and how you regularly work to improve your blog. Thanks for encouraging me to find my creative side! I’ve been inspired to share the blessings of my beautiful home and cottage more often, and to make folks feel comfortably pampered and welcome. Pasta salad!!!! It was a big hit at my Euchre club party!!! It made sooo much!! LOL. I got to share with lots of people!! I made the Southwest Pasta Salad recently as well; it was so good! We’re just a family of 4 so we had it as a meatless dinner one night, nibbled on it for lunch a few days here and there then added grilled chicken to it another night for another dinner. Needless to say we got several meals out of it. 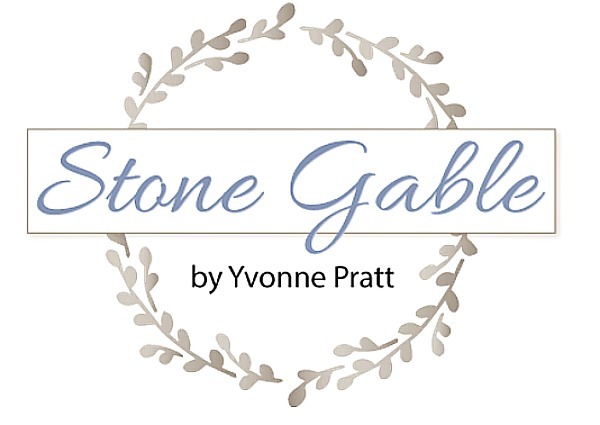 Thanks for sharing the updates and the exciting things on the horizon at Stone Gable! Your blog is one of my favorites – especially your great decorating ideas and your fabulous pictures! It’s evident that you spend much time and energy in the work you put into the blog and I am thankful! I love that you are a Christian and openly share your faith on the blog, too. You are a blessing to me and to others, I know! Looking forward to the changes you make and the exciting things you have in store! Have a great weekend…. Exciting changes! Thanks for making great home advice fun and easy to find. so impressed with all your efforts and labor of love for all of us who love Stone Gable’s style..and what i appreciate most is that you put God in the center and honor Him with all your work, doing it for the glory of God who is the creator of all things and the Master Designer! I feel connected to you since we are both believers, and I live not so far from you, over the state line in MD! Keep your light shining! thank you so much for all your skill and love of beauty, home and and hospitality! You’re the best . I look forward to your newsletter , blog and pins. You are definitely my go to for all things home. My morning ritual always includes reading your post.I want to also thank you for not having those pesky pop ups that some other bloggers have. Some are so terrible I don’t read them because I know I will have keep on clicking them off. THANKS Yvonne for all that u do!!!!!!!! What a beautiful blog! I am going to look up your pinterest page. Such a great tip Sherry! Thanks! I love that you always tell us where to find the items in your home by either posting a link or the store name. It’s a pet peeve of mine to see something on a blog or pinterest that I really like and then there’s no mention of where to find it. I remember last year around Halloween you posted some photo’s of pumpkins you had purchased and I loved them because they were white (I have always had a difficult time finding white pumpkins in my area). You said you had gotten them at Ken’s Garden. I know you are in Lancaster so I looked the garden center up on-line to see exactly where they were located. The timing could not have been better as my sister and I were headed to Lititz for a girl’s weekend (I’m in the Pocono’s). I was thrilled when we were headed back to our hotel from Kitchen Kettle Village after some fabulous shopping and we drove right past Ken’s Gardens. Needless to say, I went home a happy camper with a trunk full of white pumpkins! Thank you! Also, I know how difficult it can sometimes be to take photo’s in your/our homes depending on the time of day and light, but your photo’s are always beautifully done! I live in an old farmhouse in Maine and love all your posts. I have used many of your ideas in my home. Thank you for all the decorating ideas and recipes as well! I read Stonegable daily and love your ideas. I am making the coleslaw today and plan to make a fall wreath with a metal “C” on it. I don’t have facebook, so I hope you post winners here. Thanks! Gosh Yvonne, so busy, and yet you’re really living the dream. Go you, so happy for you. Love your great ideas for your blog. Thank you for all that you do for your readrrs. The newsletter is a great thing… I’m signing up now!! I love your blog and check it daily, thanks for sharing all your creativity with us. Have a wonderful weekend… Stay cool!!! You are so very busy, yet so very organized. Your photos are done to perfection. I love how you maintain wonderful content! Have a great weekend, Yvonne! Thanks Robin! I have such a passion for bringing readers the best!!! I really have more ideas rolling around in my head than time to do them. I think it might be time for an assistant! Your daily newsletter is one of the emails I love opening every day! I love your ideas and am amazed by your ideas. Thanks, Regina! I love to hear that! I love StoneGable ! Your posts are always so beautiful and helpful. Love your decorating style and ideas ! You are so talented and so blessed. Your blog is always full of great ideas and anyone can tell you love what you are doing. I read/view your posts daily. One of my favs witout ever a giveaway. Thanks so much for the always relevant content and GORGEOUS photography. The content is just BEAUTIFUL! You are very creative in growing your business…love your posts! The comments you are speaking of…is it comments herein this section or on Facebook or both? Keep up the great work and your enthusiasm is absolutely contagious. A feature I would love to see is our you manage to organize and store all your lovely dishes, seasonal beauties and accessories? Happy Saturday and a beautiful day in your neighbourhood! Squeeee! I Just signed up for the newsletter and am excited about all the fun things you have planned for your fans! Hi Anita, That is a great idea! I’ll put that on the schedule for the fall! Thanks so much! Yes, I often (like, every day!!) wish you could help me, Yvonne, with my storage problems regarding decor items as I now live in a condo. With no basement and no garage of course, it is very frustrating! I like to change my mantel and coffee table often and there are days, I just give up as the thought of finding storage is too exhausting. Naturally, you can’t help since you’d need to be here in person; I guess I just wanted to “air” my complaint. lol. I wonder if other viewers of Stone Gable live in condos and have the same problem. I live in an apartment and I only have the laundry room/closet/ available for storage. Each season I look over what I have and if I find something new I MUST have (most often something vintage or antique) I know I must get rid of something first. All of my items are in labeled plastic totes and like seasons are stored next to each other. I have yet to decorate the laundry room but plan to hang vintage wash boards and whatever catches my fancy!! I LOVE your blog Yvonne!!! I learned from you that there is such a thing called pillow covers! I have the same concern. I have a garage – but it’s small. I don’t have access to my attic and I do not have a basement. With a very small cottage, space is limited. Some creative ideas for storage – especially for pillows, tableware, and seasonal items – would be greatly appreciated. I have tbe same issues with space as I also live in a condo townhouse. Getting into the attic is difficult and there is no basement. I do have a small utility room on the back of the condo. Thanks to Yvonne I now realize that I can change my decor to reflect the seasons by just changing out my accessories. I now have shelves in the utility room. I have plastic storage boxes labeled with each season. If the decorations do not fit into the 2 boxes for each season, I donate them to charity. Check Yvonne’s blog for storage of pillow covers.I only have 2 sizes of pillow inserts now and change out the covers seasonally. I don’t go a day without checking in with Stonegable! It makes me happy! Thanks for all of your inspiration and your never ending bundles of energy that keep StoneGable always fresh and fun!…Have a great weekend Yvonne! Love that you will have the purchase links available! Thanks so much!!! Your blog already posts so many useful ideas. How you keep coming up with them is amazing… And now you’re adding more -amazing. Wow, sounds as if you have a lot going on and some fabulous new plans, fantastic for all your readers, shame I am in France not the USA!!! I love reading your posts! France was made for you! Your sweet daughter’s trip sounds amazing! I enjoy your postings so much, especially when, as now, I am far from home. Greetings Yvonne, I found your blog a few weeks ago and have enjoyed following you. I especially like how on Sundays you talk about the Lord. I am in the Midwest and thoroughly enjoy your Southern charm which oozes in each blog. May God bless you and yours.